It was this kind of game all night as Donte DiVincenzo runs into traffic against Providence. NEW YORK – Easy for an outsider to say when something as important to the teams involved is on the line, but the Big East championship game Saturday night was just what Villanova needed, regardless of the outcome. It turned out to be the best of all things for the Wildcats as they survived a 76-66 overtime game for the title against a Providence team that could have gone away several times but never did. Villanova has been in this championship game in all four years of the reconfigured Big East Conference and this was the third win in that span. It provides another trophy in a crowded case on campus and reaffirms the Wildcats' standing as a No. 1 seed in the bigger tournament that begins next week. So, it was cake and eating it, but the jolt of just being in this kind of struggle will do them good. 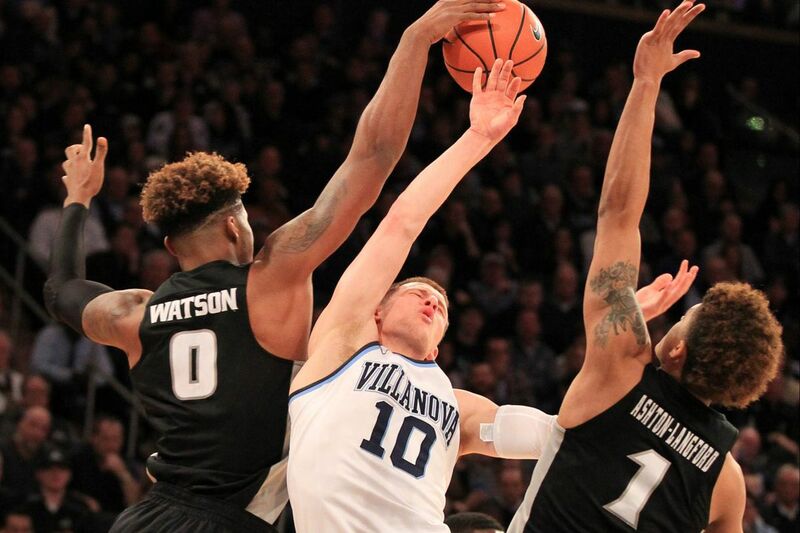 Villanova is going to find itself in this kind of game again in the NCAA tournament. They will run into another game in which the bodies are colliding and the action is relentless and the pressure that rides on every shot grows as the minutes disappear. "You don't want it that way when you start the game. You hope you get a little lead and create some separation," coach Jay Wright said. "But when it's over, you know how much this does for your team's mental toughness. And if you get into tough games in the tournament, you know you've been through it recently, and it is good for us." The next time it happens, of course, it won't be simply the end of the conference season that swings in the balance. It will be the end of the season, period, for one of the teams involved. Villanova has experienced this kind of game before, but not for a while, and certainly not since the caravan rolled out of Philadelphia for New York. If there was some concern that Villanova would enter the NCAA tournament without having to break a sweat in winning three games at Madison Square Garden, that was quickly erased on Saturday night in what became a grinding game of attrition against Providence. The Friars had a remarkable tournament, too, and one that will probably serve them well when the NCAAs begin. Providence had to play three overtime games in three days, including two straight against teams that will be No. 1 seeds next week. If it was heart-breaking for Providence to survive all those tests and come up without the final answer, this game was destined to be a heartbreak for someone. In the regular season against Villanova, the Friars split with the Wildcats, largely because of a clinging defense that held the Wildcats to 3-of-20 shooting on three-pointers in Providence. Slowing down Villanova this time figured to be more difficult, however. The Wildcats made 46 percent of their three-point shots in easy Big East Tournament wins over Marquette and Butler and the offense appeared to have shaken some of its February inconsistencies. It wasn't going to be that easy this time. Jalen Brunson and Mikal Bridges combined to score 56 of the team's 76 points, but the Wildcats weren't able to find the scoring balance that had made them so dangerous all over the court in the quarterfinal and semifinal wins. The rest of the Wildcats combined to make just 7 of 27 from the field, and the Providence defense, particularly in the second half, dogged them into turnovers that blunted what momentum they could gather. Jalen Brunson, center, of Villanova goes through Providence defenders for a basket during the 2nd half in the Big East Tournament Championship Game at Madison Square Garden on March 10, 2018. The first half was one surge after another, with Villanova building and losing two large leads before holding on to a 31-27 advantage at halftime. Another Villanova run began the second half and the Wildcats again appeared on the verge of taking control with a 45-33 lead just five minutes in, but it would take more than that to put away Providence. The Friars clawed back again and held the ball with 30 seconds left in regulation with a shot to win the championship. They missed it and Villanova never trailed in the overtime period. Mikal Bridges of Villanova hits one of his clutch 3-pointers in overtime against Providence during the the Big East Tournament Championship Game at Madison Square Garden on March 10, 2018. The biggest shot was made by Bridges, who got the ball on the perimeter after a scramble for a loose ball and sent a three-pointer softly through the net for a 68-64 lead. Providence wouldn't get the ball again in a one-possession situation. The Friars forced a couple of bad shots, Villanova scored on breakouts and the final drifted out to a 10-point margin, but this game was far from a double-digit affair. "Either team could have obviously won that game," Wright said. "We had a great player pick up a loose ball and hit a three. It's not like it was great offense or anything." What it was, in the end, was exactly what the Wildcats needed. There were probably times as it went along they wouldn't have agreed with that, but when the night ends in confetti, that's a pretty good way to get a refresher course in one of March's valuable lessons. "Sometimes, when you're playing really well, you play through this tournament and win, not easily but you don't have these kind of games. Get into the NCAA tournament, get a good seed, maybe your first-round game is like that. Then, bang, you get hit in that second round, and you're in a battle," Wright said. "When you get it here and then if you get it in the first or second round of the NCAA, you just did it a few days ago and you're very comfortable in that situation." It doesn't mean you will survive the next dogfight, but it means you will have a better chance at a time of the year when the smallest advantages can make the biggest differences. Villanova put one of those advantages in the bank on Saturday night and got the dividend of a trophy for their trouble. Not a bad night. The Villanova bench celebrates during a 2nd half run in the Big East Tournament Championship Game at Madison Square Garden on March 10, 2018.